Did you know that peanut butter made by the Aztecs and Incas around 1000 BC was more of a paste and not nearly as creamy as the peanut butter we know today? Among those who helped modify this food over its more recent history was Dr. John Harvey Kellogg (founder of Kellogg’s in Battle Creek). In 1895, Kellogg patented a process for creating peanut butter from raw peanuts—marketing it as a nutritious protein substitute for people who could hardly chew on solid food. Today, peanut butter is used as more than just a spread on toast or for cookies, candies and other desserts. Michigan craft brewers are using this thick, nutty spread in a variety of beers. And, on National Peanut Butter Day (Wednesday, January 24) we felt compelled to share these with you! The B.O.B. : Peanut Butter Porter (6.6% ABV | 30 IBUs). One of Brewmaster John’s most requested masterpieces is a blend of peanuts, chocolate, vanilla, brown sugar and milk, brewed in a porter fashion. Available on draft in the Grand Rapids pub. Draught Horse Brewery: Chocolate Peanut Butter Stout (6% ABV | 40 IBUs). This medium-bodied stout exhibits flavors of rich chocolate and peanut butter. Find it at the New Hudson brewery for sampling. Grand Armory Brewing Company: Nutter Your Business – Peanut Butter Stout (5% ABV). Built on a chocolatey milk stout base, the peanut butter makes this beer taste like your favorite proprietary cookie. If anyone asks why you’d want a beer to taste like dessert, tell them it’s “Nutter Your Business.” Available in cans and on draft – including on January 24 at the Grand Haven brewery during a special Peanut Butter Day Celebration. The Mitten Brewing Company: Peanuts & Crackerjack (6% ABV | 30 IBUs). This sweet robust porter is made with loads of REAL peanuts, peanut butter and a kiss of caramel malt. While not currently available for National Peanut Butter Day, make plans to find this brew on March 29 – opening day for the Detroit Tigers – in 4-pack 12-ounce cans and at the Grand Rapids pub. Odd Side Ales: We Be Jammin’ (5% ABV | 21 IBUs). This wheat beer is brewed with peanut butter and raspberry—a liquefied PB&J (with the crust cut off for you, too). Then, check out Peanut Butter Cup Stout (7% ABV | 33 IBUs). This seasonal favorite hosts a chocolate and peanut butter party in your mouth. Also available in NITRO (draft only). Find these bottled beers in the Grand Haven pub and in distribution around Michigan. Old Mill Brewpub: Nuddy Buddy Peanut Butter Porter (5.3% ABV | 53 IBUs). The chocolatey porter is infused with roasted peanuts and fair-trade Mexican vanilla to mimic the characteristic of your favorite childhood cookie. Sample it on draft in the Plainwell pub. One Well Brewing: Professor Nutbutter’s Peanut Butter Golden Ale (5.3% ABV). This golden ale is brewed with peanut butter, making for a great light beer option with the flavor of a peanut butter sandwich. Available in can and on draft in the Kalamazoo brewery. River Rouge Brewing Company: Peanut Butter Chocolate Stencel Stout (6.8% ABV | 70 IBUs). This American stout is made with lots of peanut butter and chocolate. Find it at the brewery in Royal Oak as well as at HopCat – Royal Oak at the time of this release. Rupert’s Brew House: Peanut Butter Porter (5.3% ABV). Brewers use peanut butter in the “dry hopping” stage to enhance the flavor while creating a well-balanced flavor that is always on tap at the Kalamazoo pub. Saugatuck Brewing: Peanut Butter Porter (5.7% ABV | 35 IBUs). This smooth, bold and creamy brew is seriously rich and delicious, crafted with peanut butter flavor – but no actual peanut butter so those who have a nut allergy can still enjoy it without fear of having a reaction to it. While this beer isn’t currently on draft at the Saugatuck brewery, you can find it at select locations around the state (Iisted online at “find our beer”). 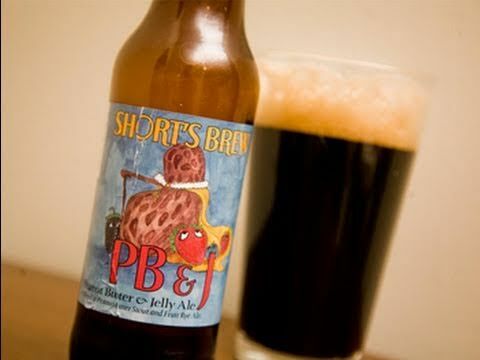 Short’s Brewing: PB&J – Peanut Butter & Jelly Ale (8% ABV | 30 IBUs). Take the popular Uber Goober Peanut Oatmeal Stout and blend it with the famous flagship Soft Parade—a fruit infused rye ale, and viola—a liquid version of a peanut butter and jelly sandwich. This customer created concoction can also be found for a limited time in bottles and is available any time Uber Goober is on tap at the Bellaire pub. Witch’s Hat Brewing: Traxx (14% ABV). This imperial stout is brewed with molasses and lactose, then aged in bourbon barrels with peanut butter, coconut, vanilla beans and Mindo cocoa nibs added. While not currently available, make plans to taste this brew in mid-March when it is released in bottles. It is the most sought-after beer in the Witch’s Hat line, inspired by Moose Tracks Ice Cream. Also look for You Just Got Jammed (9%) – an imperial milk stout brewed with lactose with peanut butter, boysenberry and cherry. This beer is currently available in the South Lyon tap room, with limited distribution throughout the state. It will be a fall seasonal release coming this fall.